When a geophysicist speaks about pre-stack data, they are usually talking about a particular class of gather. 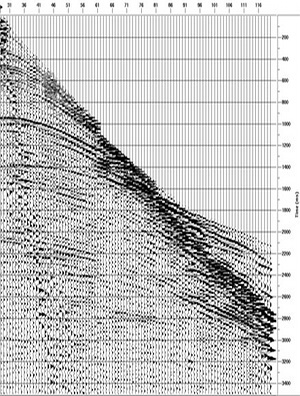 A gather is a collection of seismic traces which share some common geometric attribute. The term gather usually refers to a common depth point (CDP) or common mid-point (CMP) gather. Gathers are sorted from field records in order to examine the dependence of amplitude, signal:noise, moveout, frequency content, phase, and other attributes that are important for data processing and imaging. Common shot or receiver gather: Basic quality assessment tools in field acquistion. When the traces of the gather come from a single shot and many receivers, it is called a common shot gather. A single receiver with many shots is called a common receiver gather. It is very easy to inspect traces in these displays for bad receivers or bad shots. Image: gamut.to.it CC-BY-NC-NDCommon midpoint gather, CMP: The stereotypical gather: traces are sorted by surface geometry to approximate a single reflection point in the earth. Data from several shots and receivers are combined into a single gather. The traces are sorted by offset in order to perform velocity analysis for data processing and hyperbolic moveout correction. Only shot–receiver geometry is required to construct this type of gather. Common depth point gather, CDP: A more sophisticated collection of traces that takes dipping reflector geometry other subsurface properties into account. CDPs can be stacked to produce a structure stack, and could be used for AVO work, though most authors recommend using image gathers or CIPs [see the update below for a description of CIPs]. A priori information about the subsurface, usually a velocity model, must be applied with the shot–receiver geometry in order to construct this type of gather. [This paragraph has been edited to reflect the update below]. Common offset gather, COFF: Used for basic quality control, because it approximates a structural section. Since all the traces are at the same offset, it is also sometimes used in AVO analysis; one can quickly inspect the approximate spatial extent of a candidate AVO anomaly. If the near offset trace is used for each shot, this is called a brute stack. 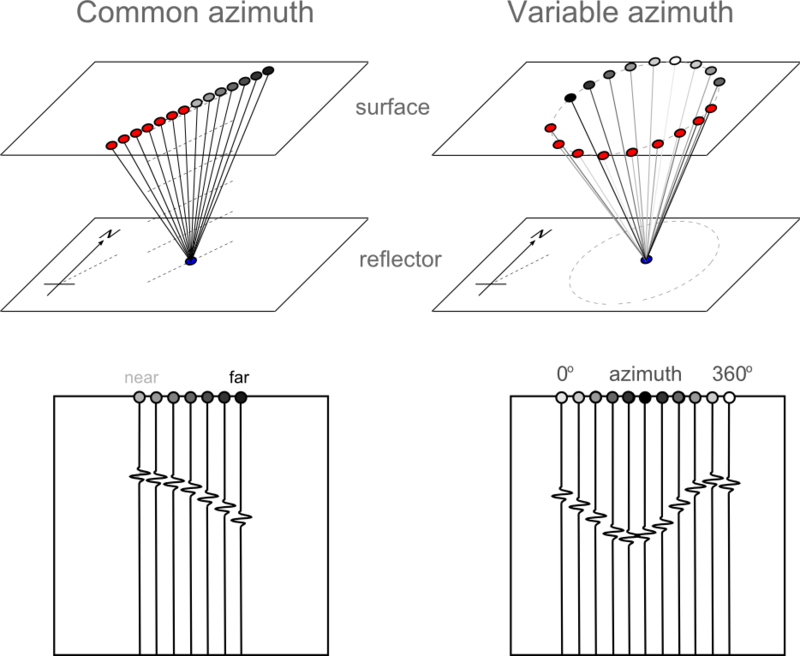 Variable azimuth gather: If the offset between source and receiver is constant, but the azimuth is varied, the gather can be used to study variations in travel-time anisotropy from the presence of elliptical stress fields or reservoir fracturing. The fast and slow traveltime directions can be mapped from the sinsoidal curve. It can also be used as a pre-stack data quality indicator. Check out the wiki page for more information. Are there any gather types or applications that we have missed? Gijs Vermeer sent Agile* an email a few weeks ago with some helpful comments about this post. It is worth re-stating that common shot, common receiver, common offset, and common midpoint gathers are wholly defined by the surface layout of sources and receivers. CDP gathers, on the other hand, require knowledge of the subsurface. As shown by this drawing, the CMP method doesn't work for dipping reflectors because the reflection point smears along the reflector. But if we know something about the velocities in the earth, we can compute the surface geometry needed to image a depth point—the common depth point. Common image point or CIP gathers, it turns out, are not as easy to draw. They result from the migration—or imaging—process. Like the CDP gather, this process uses subsurface velocity information, but CIPs cannot be constructed with a simple collection of traces. As Gijs says, "each trace in a CIP gather is the result of an imaging process that includes many input traces". We'll award a covetable prize to anyone that can draw a convincing representation of an image gather!